Not days after the internet was ablaze with Tomb of Annihilation spoilers (Courtesy of The Reserve Pool) then Tom Vasel over at the Dice Tower swings in with ‘Mighty Thor’ spoiler vid. As always – I’ve dived straight into the vid and jotted down some initial picks that stand out as cards to watch in the future. I’m pleased to see a number of the less well served affiliations get a boost in this set, especially affiliations that have had particularly tribal game-texts on past cards. Mystics, S.H.I.E.L.D., Stark Industries, and Spider-Friends have all seen their ranks grow a bit, and I’m looking forward to looking for new little combos with this set when we play one of our favourite casual formats down my FLGS: Single Affiliation. Well – I suppose in some ways the more things change the more they stay the same, because this guy marks the return of an on-demand KO Global somewhat akin to ‘Blue-Eyes White Dragon’. In fact – this guy is pretty good all round. A four cost Bolt character that gives you the tools to buy action die for 2 cheaper (ANY action die) and then cycle it around quicker after you’ve used it is going to see some serious use in the current meta. With all the ‘Cosmic Cube’ and ‘Captain Cold’s Cold Gun’ cards seeing heavy use, as well as fashionable Basic Actions & Boom Boom combos, this Guy is surely going to be one to watch. And with those decent defense stats, he’s going to be a tough thorn for your opponent to shift. Thank the Lord for ‘Scarlet Witch’! But all that aside: it marks the return of the on-demand KO in an enormously cost effective way. All those lovely “when fielded” effects that can be KO’d to the Prep Area to roll in next turn, or the “when KO’d” effects you can initiate with just one Bolt. Two rarities of the same character in one set of top picks. That doesn’t happen very often. 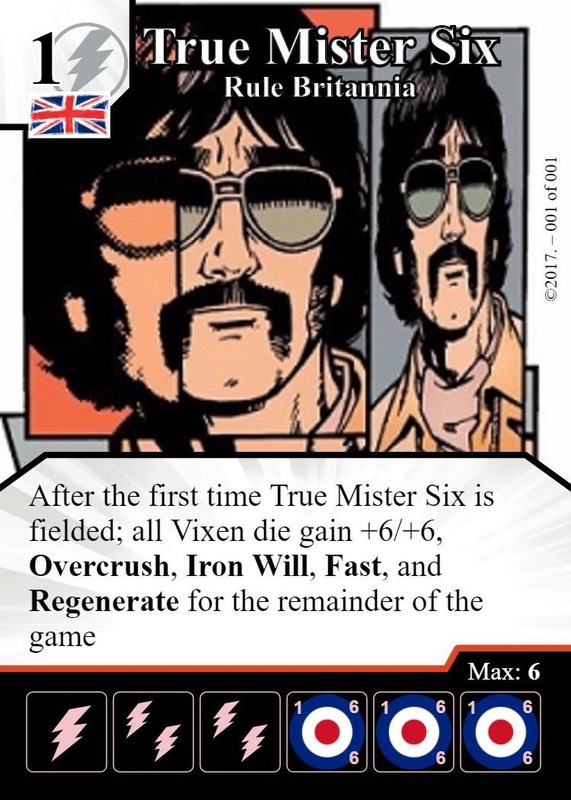 In a blanking mini-game meta where doubling/tripling up on win cons is a serious tactical consideration this is the kind of card that has a whole lot going for it. Making Sidekicks “Villains” will allow this guy to slot quite neatly into popular ‘Norman Osborne – Don’t Call Me Gobby!” teams to further maximise the damage potential, but to then provide them a nice stat bump too could tie in well with cards like ‘Gorilla Grodd – Force of Mind’ or ‘Dum Dum Dugan – Howling Commando’. Reasonable cost, decent stats, and a double-whammy game-text. Sign me up. One of my biggest bugbears with the Iron Man/War Machine Starter was that there was no ‘Pepper Potts’ in the Modern Age format to “Suit Up” ‘Rescue’. I had quite a bit of fun playing a ‘Rescue’ team at some Golden Age events we’ve held at my FLGS – and so I’m pleased to see her in this set as I think she’ll make the team viable in Modern. It’s cheap & cheerful, got a cheeky little game-text, and synergises with another card I’m fond of. What more could I want. This is a curious one, that I’ve chosen for my spoiler picks for a couple of reasons. First; it’s an example of the new “Immortal” keyword that’s been introduced in this set. While this particular character is not the most interesting use of the Keyword, he does give me an opportunity to bring it up in this post. It’s an interesting Keyword effect, and I’m interested to see what clever ways people find for using it. I, for one, am looking for ways to make “Immortal” cards unblock-able so they come back around quicker. Secondly, and most relevant, that’s one hell of an eye catching game-text; the ability to outright cancel the use of a Global with a Bolt could have so much utility for this set in the Draft format when you look at the spread of Globals knocking around. It won’t have much of a place in constructed, and isn’t ideal as any player can use it, but i might just make the difference on a Drafted team when everyone else seems to have snapped up ‘Hiemdel’ cards to pay for the high cost beat-sticks they’ve also drafted, or when a ‘Thorbuster Iron Man’ Global keeps messing with your carefully drafted “Immortal” team. “Immortal” cards look interesting, and if you did want to play around with them, this would be a hell of a way to ramp in a one-sided manner. There’s not much to say really – a purchase cost reduction of 3 on those big “Immortal” characters out much quicker, not to mention the mid-range cost guys like ‘Volstagg’ and ‘Fandral’ for reeeeeal cheap. Throw in the “Energy Fixer” global and you’ve got a sweet little card for a good tribal team from Asgard. There we are folks, a few faves that caught my eye upon first look over of the spoilers. My thanks once again to Tom Vasel for the video and to Paul Kushner for the screen caps.